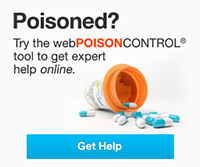 If you are exposed to any poisonous product or substance, get poison help by calling 1-800-222-1222. These are especially hazardous household items. Buy small quantities. Discard unneeded extras. Make sure they are always out of a child’s reach. Medicines: these are OK in the right amount for the right person. They can be dangerous for children who take the wrong medicine or swallow too much. Carbon monoxide: This gas is in fact an invisible killer. Take it seriously. Make sure there’s a carbon monoxide alarm in every sleeping area of your home. Button batteries: Be especially mindful of the 20 mm lit hium coin cell. When swallowed by children, especially those younger than 4 years, it often lodges in the esophagus causing burns within just 2 hours. A hole in the esophagus may develop and the burn can extend into the trachea or aorta. More than 40 children have died from swallowing button batteries. Iron pills: Adult-strength iron pills are very dangerous for children to swallow. Children can start throwing up blood or having bloody diarrhea in less than an hour. Cleaning products that cause chemical burns: these can be just as bad as burns from fire. Products that cause chemical burns include include drain openers, toilet bowl cleaners, rust removers, and oven cleaners. Nail glue remover and nail primer: Some products used for artificial nails can be poisonous in surprising ways. Some nail glue removers have caused cyanide poisoning when swallowed by children. Some nail primers have caused burns to the skin and mouth of children who tried to drink them. Hydrocarbons: This is a broad category that includes gasoline, kerosene, lamp oil, motor oil, lighter fluid, furniture polish, and paint thinner. These liquids are easy to choke on if someone tries to swallow them. If that happens, they can go down the wrong way, into the lungs instead of the stomach. If they get into someone’s lungs, they make it hard to breathe. They can also cause lung inflammation (like pneumonia). Hydrocarbons are among the leading causes of poisoning death in children. Pesticides: Chemicals to kill bugs and other pests must be used carefully to keep from harming humans. Many pesticides can be absorbed through skin. Many can also enter the body by breathing in the fumes. Some can affect the nervous system and can make it hard to breathe. Windshield washer solution and antifreeze: Small amounts of these liquids are poisonous to humans and pets. Windshield washer solution can cause blindness and death if swallowed. Antifreeze can cause kidney failure and death if swallowed. Wild mushrooms: Many types of mushrooms grow in many areas of the country. Some are deadly to eat. Only experts in mushroom identification can tell the difference between poisonous mushrooms and safe mushrooms. Alcohol: When children swallow alcohol, they can have seizures, go into a coma, or even die. This is true no matter where the alcohol comes from. Mouthwash, facial cleaners, and hair tonics can have as much alcohol in them as alcoholic beverages. Drain cleaners and toilet bowl cleaners: These caustics cause devastating burns to the mouth, throat and stomach. Drain cleaners may be strongly alkaline and toilet bowl cleaners may be strong acids. If swallowed, they must be diluted immediately to limit the damage that rapidly occurs. Topical anesthetics: These medicines can cause seizures or a condition called methemoglobinemia which keeps the blood from carrying oxygen to the tissues. Be especially careful with teething gels, hemorrhoid preparations, anti-itch creams, and sunburn relief agents.